Login/Sign up your Account on Artcarro. 10 winners will get 100 Rs. recharge. other winners will get 20 Rs. recharge. It is a promotional offer designed by Artcarro. Anyone can predict the score before the start of the match. Each user will get only one chance per match. We will notify the users who predicts the correct score. Correct predictors will get Portrait Sketch or Recharge as a reward. Portrait sketches will get deliver within 7 days. Recharges will be done on next day of match. Share it with your friends so that they also can get the chance to win a Portrait Sketch. 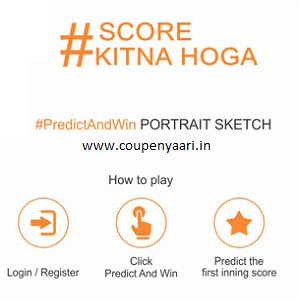 Enter your prediction for the score of the 1st innings of the selected match. You can make only 1 predictions for a match. Your prediction is registered! If your prediction is correct you will get a reward. 1st 3 winneers will get Portrait sketch. Next 10 will get Rs. 100 recharge. Rest winners will get Rs. 20 recharge. For e.g. 1st inning score is 160 and you predicted 161 or 159 then also you will get a recharge of 10 Rs. If we found any fraudulent activity then that account will get terminated even without any prior notice. This promotional offer is valid for mumbai users only. Artcarro reserves the right to end any or all offers at it’s sole discretion without any prior notice. Artcarro is an online art marketplace where users can buy Portrait Sketch. Our artists make originally handmade portrait sketch for our customers because original is always original it can’t be replaced by any printing technologies. We believe gifting a portrait sketch is one of the best gifting option anyone can have. Our aim is to satisfy every customer who places an order with us.